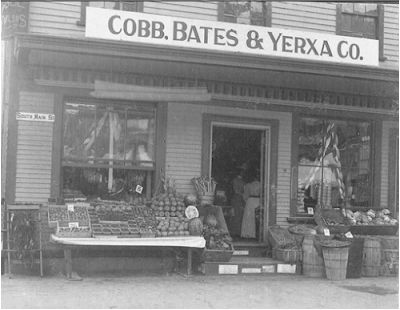 Cobb, Bates & Yerxa was a Boston-based regional grocery chain which briefly operated a Middleborough branch on South Main Street at the turn of the last century. In addition to stores in Boston and Middleborough, the company had branches in Chelsea, Fall River and Taunton. 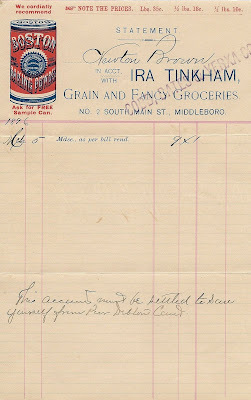 Sometime about 1896, the company acquired the Middleborough Four Corners grocery business of Ira Tinkham, which it continued to operate under its own name in the American Building. At the time of the acquisition of the Tinkham firm, Cobb, Bates & Yerxa was believed to be the largest grocery retailer in New England. For most of its short existence in Middleborough, the firm was managed by Amos Clark. In February, 1900, Middleborough grocer Matthew H. Cushing acquired the local Cobb, Bates & Yerxa operation and relocated his own grocery there. The photograph depicts the front of the Cobb, Bates & Yerxa store which was located in the American Building on South Main Street and which operated from about 1896 through 1900. The firm made use of all available space, including the front steps. Notice the rack of herring at the far left. Cobb, Bates & Yerxa acquired Tinkham's grocery, long a Four Corners fixture, about 1896. The firm may have also inherited customers delinquent in their payments as the note at the bottom of the bill indicates, informing Newton Barrows that "This account must be settled to save yourself from Poor Debtor's Court." The bill is overstamped "Cobb, Bates & Yerxa Co."